Home Archive for category "Subscription Boxes"
I don’t even know where to begin with this one. There are repeat items, and man .. I really don’t care about Clinique. Clinique engages in animal testing and it’s always felt like something more suited to my grandma than me. I want to see indie brands who are cruelty free and do something new and unique, not the same old boring crap some company has been doing for far too long. Sephora, you’re better than this. Also, the website “View Box” detail hasn’t matched what I received for this and last month. Minor nitpick, but clearly something is wrong on Sephora’s side. Either I’m getting the wrong box or they’re not showing the customization on each box on the website anymore. Kat Von D Saint & Sinner perfume – 50 mL / $65 – (Two samples, 1.5 mL each, value of $3.90 by volume) Received in the August 2017 Sephora Play box, so I’ll just point you there. (link). But also, Kat Von D is also apparently an anti vaxxer, and I’m pretty much done with her as a result. She backtracked later, saying she just had concerns, but you don’t make a post saying you’re going to raise your child “without vaccinations” and then say LOL JK later. Wander Beauty Baggage Claim Gold Eye Masks – 6 masks / $25 – (One mask, value of $4.17) I mean, this is neat, and it’ll be fun to try, but this isn’t a product I’d ever buy for myself. The price point is way too high to be a regular-routine kind of thing, and I just don’t need them. Caudalie Vinoperfect Radiance Serum – 30 mL / $79 – (10 mL, value of $26.33) I find it kind of hard to believe this tiny sample is worth $26. While I don’t think I’ve gotten this in the Play box before, I know I have samples of this around from other Sephora orders, so this is just not that exciting. Also, that tube is only about 1/4 full, with the product only coming up to just under the line above “Radiance Serum” which is a total waste of packaging. Bite Beauty Amuse Bouche Lipstick – .15 oz / $26 – (.05 oz, value of $8.67) The color I received is “Sake” which is described as a Dusty Mauve. You know, basically the same shade as the other Bite Beauty product I got last month. I still love this company and they’re cruelty free and awesome, but two products, two months in a row in the same color? Mix it up a little! Clinique Moisture Surge – 1.7 oz / $39 – (.24 oz, value of $5.51) The first bunch of ingredients are silicones and glycerin, which is really not that exciting. I mean, I’ll still try it because I’ve got crazy dry skin, but .. meh? Clinique Quickliner for Eyes Intense – .012 oz / $18 – (.005 oz, value of $7.50) It’s a black eyeliner pencil. Yay? I mean, again, nothing new. If it had been a unique color or new formulation or something, I might have been interested. But. Clinique. Black. Eyeliner. It’s basically plain oatmeal. So the total value comes to $56.08 for a box that only costs $10.60 per month. For a personal value, while I’ll use the lipstick and everything but the perfume, I’m just not excited about any of this. It’s all old news, repeats, and nothing thrilling. I’m not even sure this box was worth $10.60 since I can pretty much get any of those as samples with purchase or using reward points from other orders. Sephora, if the point of this box was to get people to try new things to encourage future purchases of the full size items? This was a complete flop. I mean, again, for $10 a month, I’m having a hard time cancelling the box, but after the last two, I’m getting closer to just saying the hell with it. Another month, another Medusa’s Makeup subscription box! This is the one for the current month, January 2019, and it arrived at least a week ago, maybe more. I did say I’m getting back into blogging, but there’s some catch up to do here. Anyway! This month featured four items and a bonus clear zip bag, and as usual, everything is vegan and cruelty free. Totally Baked Eyeshadow – 2 g / $9 – (Full size product) The color is “Fer Sure” and it’s a coppery red color. The eyeshadow is incredibly pigmented, but it can be applied lighter or a super-pigmented gorgeous metallic color. This is the kind of color that works really well to kick up the green in my eyes, so I LOVE this one to bits. Lip Balm – .1 oz / $8.95 – (Full size product) The flavor is “Cha Cha Cha Cherry Bomb” (HELLOOOO EARWORM!) and it smells exactly like a very popular brand of cherry lip balm, but this one is vegan and cruelty free. Perfect timing for my dry, chapped winter lips. Metallic AF Lip Gloss – .2 oz / $11 – (Full size product) The color is “Bad Medicine” which is a metallic light pink gloss. It goes on like a gloss but then dries almost like a matte lipstick, so it sticks around for a while. The color and metallic shine may be a bit outside of my makeup comfort zone, but I think using this as a layer over a darker lipstick might be fun to try. Mystical Eyedust – 3 g / $11.95 – (Full size product) The color is “Psykhe” which is a really interesting chameleon of a color that looks purple and brown but with a gold shimmer. It’s a really neat color and I can’t wait to use it. Makeup Bag – ?? – Bonus item this month! I’m not a huge fan of plastic, but I do like having bags like this for travel, and I’m pretty sure this one would be okay to use as your carry-on baggie of liquids on a plane. The total value of this box comes to $40.90 plus the value of the bonus makeup bag which is pretty great for a cost of only $16.95 per month! It looks like the price went up $1 this past month, but the longer term subscriptions of 6 and 12 months bring the price down to $15.50 and $14.95 a month respectively. 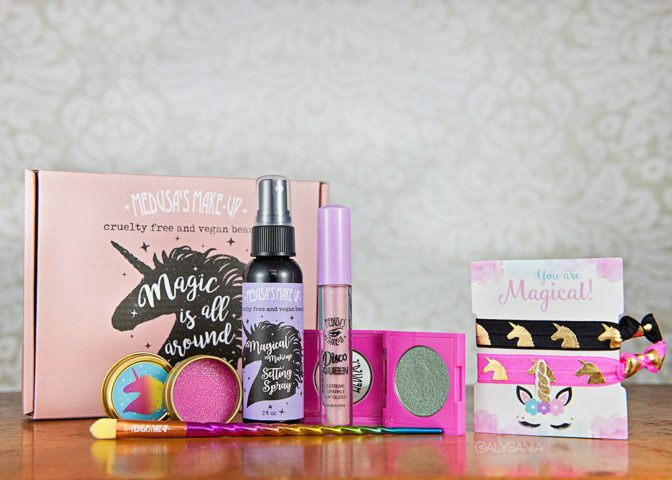 I love that all the products are cruelty free and vegan, and it’s just a fun box to get every month. Since I’m back on blogging, here’s my Sephora Play! box for January 2018! My box was variant #279, and I have to say it was mostly a miss, but I’ll get into that below in the box contents. I’ve been subscribing to this one since nearly the beginning (since it was available in my area), and sometimes it’s a big hit, and other times it’s just all wrong. They still can’t seem to get the curly hair items together, and I really don’t need yet another Smashbox Primer product (I’ve gotten Photo Finish twice, and I know I have samples of the Primer Water around too). I do like the switch to these plastic zip bags – I mean, they’re plastic which, meh, but they’re way more useful for travel since they’ll contain spills and products that accidentally open mid-flight, but again, overall I could do without the bag. Hum Daily Cleanse Supplement – 60 capsules / $25 – (Product is 6 capsules, value of $2.50) These are going straight to the trash. I don’t want ‘dietary supplements’ in ANY beauty box, not to mention that stuff like this is worthless. You’re not going to detox or cleanse anything by taking these, other than that you’re going to pee out nearly 100% of what’s in there, and you could possibly do harm to your body by taking a supplement you don’t actually need. What a waste. Bite Beauty Matte Creme Lip Crayon – 1.56 g / $24 – (Product is .89 g, value of $16.27) Color received is “Glacé” which is a dusty mauve. Mauves usually don’t work well with my skintone, but this one is just cool enough that it looks great! Plus, Bite is cruelty free and already a favorite. Origins Clear Improvement Mask – 1 oz / $13 – (Product is .5 oz, value of $6.50) Charcoal masks are great and I use them all the time, so I’ll definitely use this one. It’s nothing new to me since I know I’ve bought this before, but at least it’s not sketchy vitamins. Smashbox Primer Water – 115 mL / $32 – (Product is 5 mL, value of $1.39) Meh. I don’t use primers often since I rarely to never use foundation, and I know I have a sample of this around here already anyway, plus I have probably a dozen of the regular non-water Smashbox primers too. Laneige Water Sleeping Mask – 70 mL / $25 – (Product is 10 mL, value of $3.57) I have super dry skin, so this will be fun to try! Marajo Cleansing Creme & Deep Treatment Butter – 8.5 oz / $29 and 5.3 oz / $29 – (Products are both .23 oz, total value of $2.04) A hair product that contains silicones, acrylates, and sulfates. Curly hair that isn’t washed using a traditional shampoo with SLS/ALS cannot use these products because they cause buildup. This is going straight to the trade/give-away box. I think the reason I’m so disappointed with this box is that here we are starting a new year, and it’s all old products really. I’m super disappointed with the inclusion of a supplement especially considering the science keeps proving over and over and over again that they’re useless and can actually do more harm than good. It’s irresponsible to send these out without having some kind of opt-in for this kind of product. The value in total comes to $32.27. For a personal value, the Bite Lip Crayon makes this box worth the $10.60 cost for me alone since I really do love the color and will absolutely use it. The rest is kinda meh. Two products (hair care and supplement) are either being tossed or traded/gifted, and while I’ll probably use the remaining three (primer, two masks), I’m not really thrilled about them. I know Sephora is sending out TONS of these boxes at this point, but they’re doing a really poor job at customization and keeping things fresh and new – it’s been a lot of repeats and old products instead of new items to explore and discover. I wish they’d let you review your box and give ratings to let them know what you loved, hated, didn’t use, or were ambivalent about. Anyway, I suppose for $10.60 a month, I really don’t have a lot to complain about, and getting samples to try, even if I’ve tried them three times before, is still worth the money for now, but if this keeps up, it might not be. I wanted to get back into the habit of posting subscription boxes and whatnot even though I’ve dropped a bunch of subscriptions this year. We’ve been away or moving most of the year, so it didn’t make sense to keep receiving stuff I wasn’t home to use (or, not wearing yoga pants and t-shirts 24/7 for months on end). Anyway! I jumped back on Medusa’s Makeup after a hiatus when I saw this box teased on social media. Unicorns, I’m in! Unicorn Farts Lip Sparkle – 2 g / $10 – (Product is full size) The sparkle looks like it would show up like crazy, but not a whole lot of it transfers to your lips, so it ends up being just a subtle pink shimmer. AND, it smells like cotton candy. What’s not to love? Magical Makeup Setting Spray – 2 oz / $11.95 – (Product is full size) It has a light, fresh smell, and while it dries a little slower than some other popular setting sprays, it didn’t feel tacky or sticky at all. Disco Queen Lip Gloss – .2 oz / $11.95 – (Product is full size) Oh boy, I’m usually not that into lip gloss, but this one is surprisingly not sticky and goes on more like a lip balm but with decent glitter payoff and has this pretty peachy shimmer. It’s enough to be like HELLO GLITTER, but not so much that it’s WHOA, GLITTER. Plus, it smells like cupcakes. Glam Rock Eyeshadow – 2 g / $9 – (Product is full size) The color is “Heroes” and is a shimmery, metallic forest green. It’s really easy to blend, so it can go on as lightly as you want, or crazy full blast deep, dark green. Rainbow Brush – 1 / ?? – (Bonus item) I mean, how could you have a unicorn box and not include something ridiculously rainbow fantastic. Love it! Unicorn Hair Ties – 2 / ?? – (Bonus item) I go through hair ties constantly, so extras are always welcome! The value of the items comes to $42.90 and the value of the bonus items is reported to be $12 according to the product card. The beauty box only costs $15.95 per month including shipping, so we’re well over double the cost even without including the bonus item value! I was surprised that I love the lip gloss this much (and I mean, I really really do), and I’ll definitely use everything in here, so chalk this up as a winner for me. What’s even better is that every item in the box is vegan and completely cruelty free.